My midwestern summer has been severely stunted. I’ve planted at least three times because: SNOW IN MAY?!??! But hopefully things are on the right track now. Snap peas are poking their little green heads out of the soil, and I’ve even got some strawberries that look like they might ripen any day. But, thankfully, I’ve also got the grocery store and I’ve been stocking up of fresh, juicy pints of organic strawberries almost every single day. I use strawberries in a million ways, from ice cream to barbeque sauce, but I really really love strawberry salads, especially when the little guys are at their ripest. The berries take to tangy ingredients so beautifully, their aromatic sweetness providing a perfect balance. I love this simple salad with mâche, which, if you’ve never had it, is a velvetty salad green with a complex flavor; earthy, nutty, grassy and peppery all at once! It’s pronounced like “mosh” for all you punks, and sometimes it’s called “corn salad” or “lamb’s lettuce.” I know that gardens and CSA boxes are overflowing with mâche this time of year, and I was even able to purchase some at my local Whole Foods. The end result is dizzyingly delicious with the addition of fresh basil and toasted almonds. 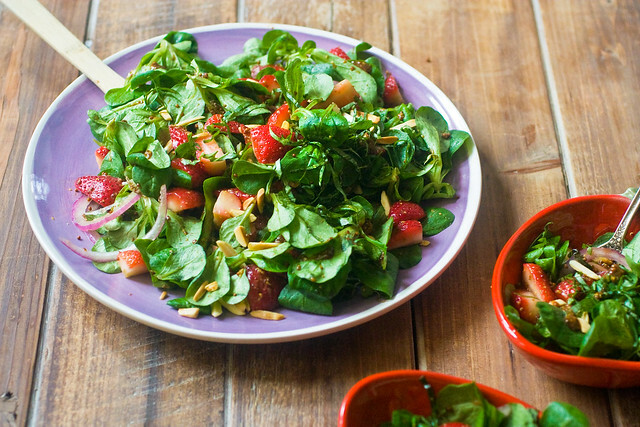 If you’ve never strawberried a salad, now is the time. ~ If you can’t find any mâche, then a spinach/arugula mix would be really nice, too. ~ I love the look and texture of whole grain mustard in the dressing, but some regular old dijon would be just as delicious! To make the dressing, just mix all of the ingredients together in a little bowl. Next, toast the almonds. Preheat a small pan over medium low heat. Toast for about 5 minutes, tossing frequently, until honey brown. Remove from heat and set aside. 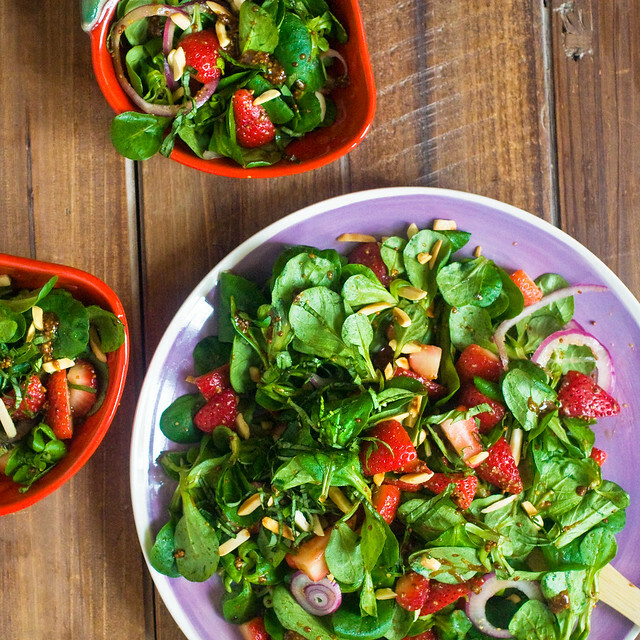 To assemble salad, In a large mixing bowl, toss together mâche, strawberries and red onion. Add the dressing, and toss to coat. Top with almonds and basil, and serve! Oh for crying out loud. I’ve grown mâche but had no idea how it was pronounced. I usually avoid salads with fruit because I don’t care for sugary dressings that usually accompany them, but this looks absolutely perfect. This looks beautiful! I’ll try with toasted pumpkin seeds, since my son is allergic to almonds. Thanks for sharing it. Lots of beautiful strawberries in the markets these days. 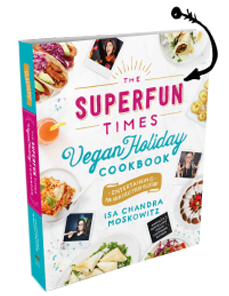 Look forward to making it soon. I’ve been eating mâche, aka Feldsalat, all winter in Germany. I look forward to trying this new variation! Hi, The salad looks lovely! Lambs-quarters is a different plant altogether. I think you are thinking of ‘lamb’s lettuce’ which is, indeed, an alternate name for mache. YES, whoops. I’ll update it as soon as I get home. Thanks for the catch! I love “strawberried” salads! This looks delish! Can’t wait to try this dressing on strawberries! Just made this for dinner tonight. It was a “salad for dinner” kind of night. Added in the avocado, some walnuts, and some cut up and fried veggie brats. It was SO good! My husband was amazed at how a little salad could taste so good. I loved the simple, but incredibly packed with flavor dressing. Thanks for another great recipe! Oh my, this looks super yummy! I have been buying strawberries every week and eating them plain. This week they are going in my salad! First time I read one of your recipes for strawbs in a salad (from one of your other books) I was like, ‘what?! Is this some crazy American thing?! !’ But I had strawbs with spinach & it was freakin’ amazing! I learnt never to doubt Saint Isa again. You rock your highness! This looks wonderful. If I were to serve this with an entree, what would you suggest? This was ace, but I think quantities may be erroneous? I thought the amount of wholegrain mustard may be too overpowering, so used less. Thank you for such a lovely recipe. As regards pronunciation, ‘mâche’ is pronounced ‘mash’, and not ‘mosh’; the circumflex (ˆ) in French denotes the omission, over time, of an ‘s’ (hence, ‘hôpital’ for ‘hospital’, etc.) and changes not the vowel sound. I’ll right away grab your rss as I can’t to find your e-mail subscription hyperlink or newsletter service. recommend you few attention-grabbing things or suggestions. am going to return yet again since i have bookmarked it. and can’t wait to take a look when I get home. I’m amazed at how quick your blog loaded on my mobile ..
just wondering if you get a lot of spam feedback? If so how do you reduce it, any plugin or anything you can recommend? Howdy, There’s no doubt that your site may be having web browser compatibility problems. for a similar matter, your site came up, it looks great. I’ll be grateful for those who continue this in future. Lots of other folks might be benefited out of your writing. the format in your blog. Is this a paid theme or did you customize it your self? use a few of your ideas! to give a contribution & assist other users like its helped me. I will be sure to bookmark your blog and may come back from now on. I want to encourage you to ultimately continue your great writing, have a nice day! Wow very healthy salad for health. I just love strawberries and will love to eat it too.